In 1951, 12,500 Moluccans arrived for a ‘temporary’ stay in the Netherlands, where they lived in camps until the 1960s. These camps consisted of a long row of barracks housing 18 families with one building that held the central kitchen and the office and home of the Dutch camp manager. Unable to save the entire camp, the museum moved the administration building, restored the portion containing the central kitchen and manager’s home, and recreated the interior of part of the barracks for the Moluccan immigrants (which would have historically been in a separate building). I was one of the few visitors who read the introductory label that explained the interpretation, so I wonder how many people left thinking that this was actually how these barracks appeared and how it may affect their memories of the 1970s, when the second generation of Moluccans violently revolted against their treatment by the government. Did they walk away thinking it wasn’t so bad after all? Sharing the same area as the Moluccan Barracks is a recreational vehicle, which although it looks like a trailer that was pulled behind a car on vacations, it was permanently left in a campsite in the countryside. Here the van der Werf family spent their weekends from spring through fall and “for generations of Dutch people, this was the way to holiday.” It’s cool to see something so ordinary preserved and interpreted at an historic site, especially since the interior is furnished to 2012 (just three years ago!). Many visitors can reminisce about their family vacations, but wouldn’t it have been interesting if they made the connection to the Moluccan camp a few meters away? Camping and “getting away” might be redefined. The post-war period might be redefined. Both places existed at the same time in the countryside of the Netherlands, but the museum chose to interpret them to different periods. Was this a missed opportunity to tell a bigger story? From across the lawn, the big thatched roof was incredibly charming and I couldn’t wait to explore this 17th century farmhouse. Boy, was I surprised. The interior is restored to 2002, when it was the home of Dutch State Secretary Cees van Leeuwen. Huh? A big open living room/dining room/kitchen show off a leather sectional sofa, a fireplace pit, and black granite countertops but why is this place important? The primary label about the van Leeuwen family mentions that Cees was a lawyer, State Secretary of Culture from May to October 2002, and that “together with his wife and three children, he lived here in the best traditions of the countryside.” Huh? Nothing seems to have happened here. I guess it’s another example of “lifestyles of the rich and (somewhat) famous,” which is probably what all the other restored farmhouses are about, just from different periods. Most visitors walked through without stopping. I wonder how the museum justified all the expense to move this building and restore it, given the meager engagement. The question of when does something start becoming “historic” and worthy of a site or museum is an interesting one. I visited the Berlin Wall museum in the spring. It’s unquestionably historic, but for a large number of people, also fairly recent. The museum and site–a section of the wall across from the museum has been preserved–did an excellent job presenting many perspectives, including video clips with recent interview of people who played a role or experienced the wall in a specific way. 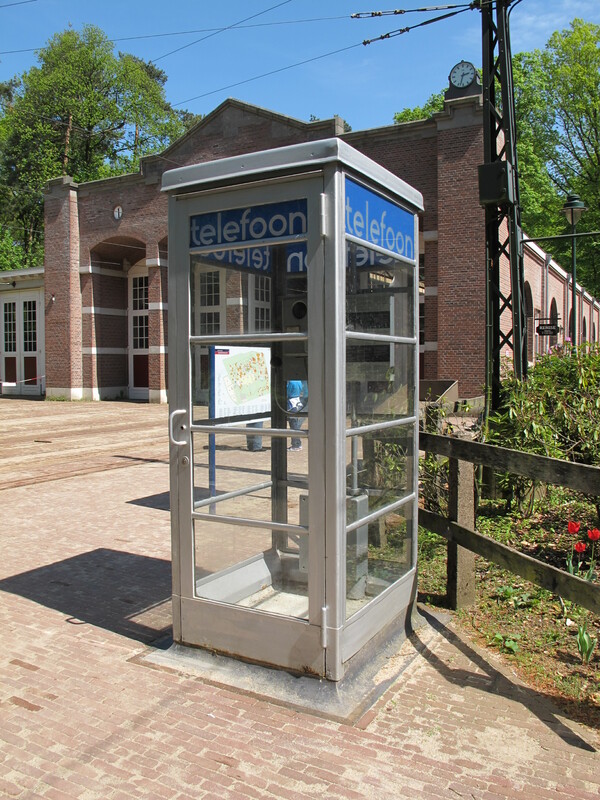 Up until the ubiquitousness of the cellphone, the 1860 train depot in my small Southern town had a 1960s phone booth in front of it! As a museum curator, I can see that they made some very interesting curatorial decisions. It is easy to overthink as an end-user/visitor what should and should not have been explored, researched and later interpreted. It is a tough position to be in to have to choose a time period for which to write content and direct the interpretation of a structure that has a long history. I respect the efforts at this museum to draw the stories of several structures into the 20th and 21st centuries – that is very gutsy approach and risks a lot of second guessing – from what I see they have accomplished the interpretation very well. I personally like the juxtaposition of and illustration of overlapping technology across time periods with the telephone booth in front of the older structure – makes one think!